One of PriumaryClinic’s major priorities is enabling your practice to quickly receive payment for the care you provide your patients. This is what drives our team to continuously work on special initiative projects that benefit your practice and patients. We encourage you to take advantage of our integration project with LanternPay to enable electronic TAC claims, which is on the last leg of its pilot stage. The TAC has extended the LanternPayfee free period until 18th May 2018. 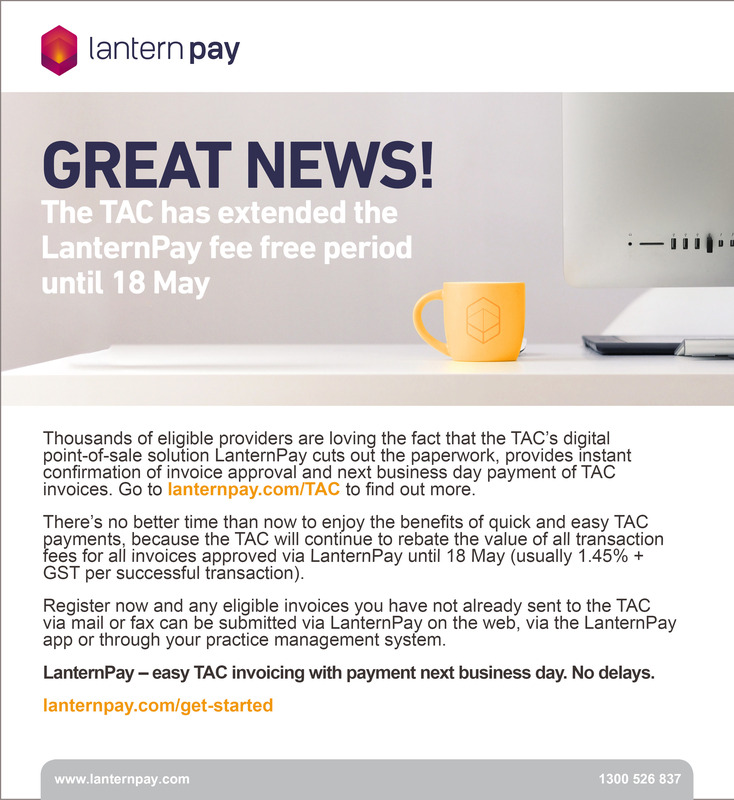 The TAC has extended their LanternPay fee-free period for another six weeks, ending 18 May. This is a great opportunity for clients using PrimaryClinic Practice to try the feature. If you are interested, click the button below to sign up. PrimaryClinic is delighted to announce our integration with LanternPay – a faster, more convenient way providers transact with TAC. If you are interested is submitting TAC claims online then be sure to join our pilot project and register your interest below. Read our online tutorial to see the complete electronic TAC Claim workflow. Secure video conferencing technology forms an integral part of our digital solutions for the healthcare industry. We would like to invite you to give your patients access to your services from anywhere by providing them with the ultimate alternative to in-person consultations. Thanks to advances in technology, GPs, Specialists and Allied Health providers are no longer limited to solely helping patients who are physically present in their rooms or practices. By incorporating Global Health’s secure teleconferencing service into your practice offering, patients can have access to your valued services anytime, anywhere! The platform is not only secure by Australian telehealth standards but it is also convenient and can be easily accessed (by provider and patient) via computer, tablet or mobile device. Have you seen this button? Did you know that this is our Lifecard button? Lifecard is a tool allows you to securely send health documents, measurements and results to your patients’ Lifecard account directly from your PrimaryClinic software. Making use of this button will not only help to improve the quality of patient care but it will also empower your patients to take charge of their health from a holistic view.